The Ivy Foundation is the largest privately funded brain cancer research foundation in North America. Ben Ivy was born in Everett and died relatively young of a Glioblastoma. His wife, Catherine Ivy, is the founder and president of the Ivy Foundation, which has a research funding focus on glioblastoma multiforme (GBM), the most common and deadliest of malignant primary brain tumors in adults. She met Greg and was impressed with both his knowledge and experience – as well as his enthusiasm and passion for finding the cure for brain cancer. Out of this connection ultimately arose the Ben and Catherine Ivy Center for Advanced Brain Tumor Treatment at the Swedish Neuroscience Institute. On another occasion, through Greg’s avid interest in bringing together a community to discuss his favorite subject, brain cancer, and his research work with Leroy Hood, a very unique event was organized at the Dorothy Jayne Studio along the Everett waterfront. The Dorothy Jayne Studio, named after my mother, a local dance teacher and arts enthusiast, and often a venue to some of the most famous in the national and international world of ballroom dancing, took on a very different purpose that night. Highlighting Greg’s interest in piano music and tireless personal advocacy for his patients with malignant brain tumors, Dehner Franks, pianist and composer, was asked to perform a piece of his music dedicated to those with personal struggles, “Help Me To Stand”. The whole evening was arranged around the presence of a world famous scientist and research colleague of Greg’s, Leroy Hood M.D. PhD. Leroy Hood, an American biologist, was given the 2011 Fritz J. and Dolores H. Russ Prize “for automating DNA sequencing that revolutionized biomedicine and forensic science” and the 2003 Lemelson-MIT Prize for inventing “four instruments that have unlocked much of the mystery of human biology” by helping decode the genome. This memorable evening was by attended many physicians and administrators of Providence Hospital and community leaders – as well as others from the Seattle area including Dave Sabey, developer, who transformed the old Providence Hospital in Seattle into the Swedish Neuroscience Institute. (See menu – “Leroy Hood M.D. PhD – Special Event” and, you will hear Greg delivering the introduction of Leroy Hood). Several years ago, through Greg’s enthusiasm and persistence the Swedish Annual Fund Raising Gala was focused upon brain cancer. Although some doubted that much money could be raised for only malignant brain tumors or Glioblastoma, an “orphan tumor”, Greg proved all the doubters wrong. The Gala raised approximately $4,000,000.00 and was the most successful fund raiser in the history of Swedish Medical Center. Since this event was not recorded but was obviously a milestone in Greg’s career, I asked Greg if he would be willing to give the same presentation in Everett so that his presentation could be recorded. The event took place at a meeting of the Everett Rotary Club at Naval Station Everett on the Everett waterfront, July 15, 2008.Dave Brooks and others from Providence Medical Center along with interested community leaders were present that day. (See menu – “Greg Foltz – Everett Rotary Club”. Also, to gain a better idea of what it may be like for your family to be afflicted with brain cancer – like that of the Ben and Catherine Ivy family – please view the patient video, created in Seattle, also included in the same menu site). On July 15, 2013, family, friends and some of Greg’s many patients gathered together at Benaroya Hall, where Greg and his wife Luba were married to symphonic music written by Greg and played by members of the Seattle Symphony only a few years earlier. It was at Benaroya Hall on this very different occasion that Greg’s life was celebrated. It was an inspiring presentation by Rod Hochman M.D., Marc Mayberg M.D., Leroy Hood M.D. PhD and members of Greg’s extended family, Michael Beatty M.D. and Ann Beatty M.D. Rick Eaks, who grew to know Greg well, along with myself, would like to share this message and video remembrance of Greg with all who knew and loved him – including his wife, Luba, their two young children, his patients, all of his colleagues and supporters, whose lives he touched. Futhermore, it is our hope that not only his children but his children’s children will someday get a chance to see this video presentation – and be reminded that Greg was so loved by so many. 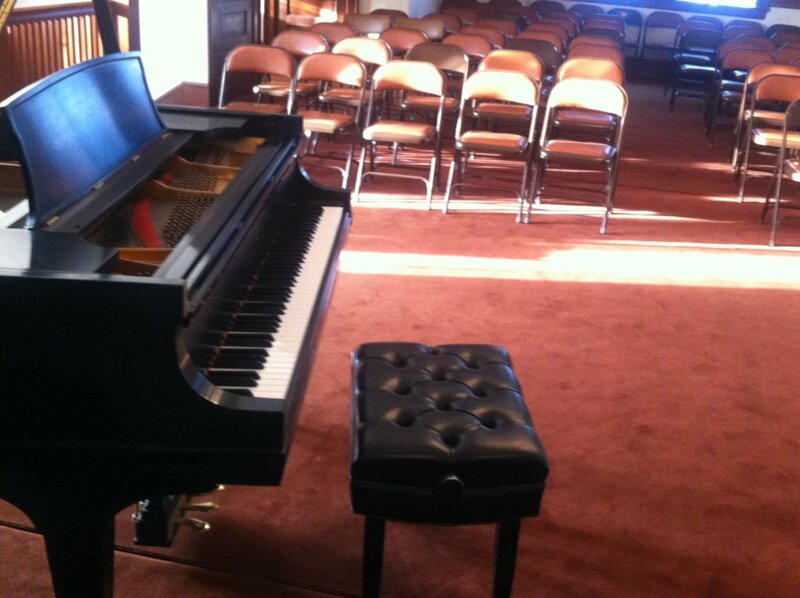 Greg Foltz often enjoyed playing this Steinway piano located on the 3rd floor of the Everett Neurological Center at The Historic Hartley Mansion.